I totally had a different story-line in my mind the first few minutes watching this vidz a couple of months back. Had a stir towards the end. I hadn't have that sensation in a while. 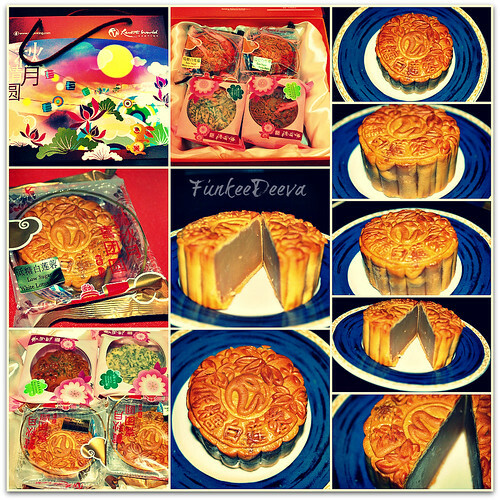 RESORT WORLD SENTOSA - MOON CAKE, a photo by Funkee Deeva on Flickr. From University of Wikipedia: The Mid-Autumn Festival (simplified Chinese: 中秋节; traditional Chinese: 中秋節; pinyin: zhōngqiū jié), also known as the Moon Festival or Chinese Lantern Festival or Mooncake Festival or Zhongqiu Festival, is a popular lunar harvest festival celebrated by Chinese and Vietnamese people. A description of the festival first appeared in Rites of Zhou, a written collection of rituals of the Western Zhou Dynasty from 3,000 years ago. The celebration became popular during the early Tang Dynasty. The festival is held on the 15th day of the eighth month in the Chinese calendar, which is in September or early October in the Gregorian calendar, close to the autumnal equinox. The Government of the People's Republic of China listed the festival as an "intangible cultural heritage" in 2006, and it was made a Chinese public holiday in 2008. It is also a public holiday in Taiwan. 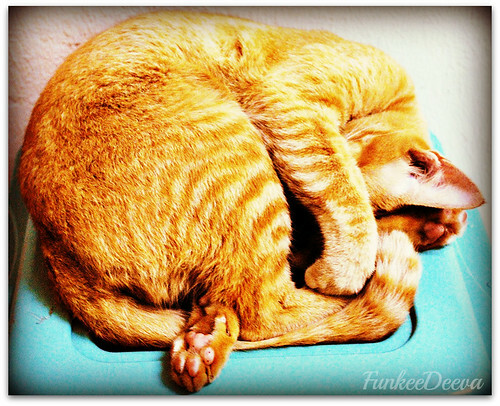 BEST SLEEP EVERRR, a photo by Funkee Deeva on Flickr. 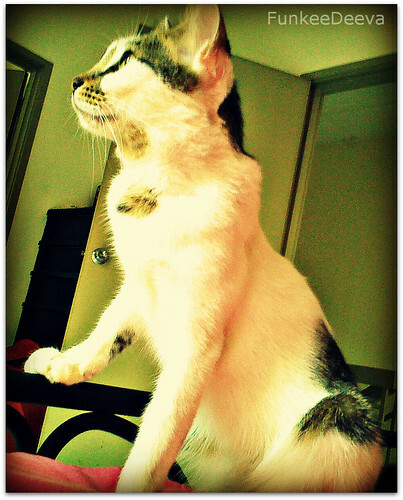 She specialises in catsleep and eat-a-lot. 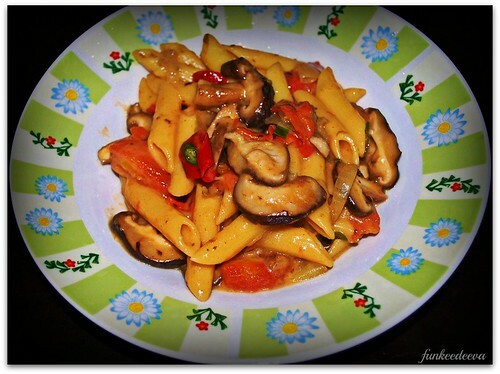 PASTA CRAVING, a photo by Funkee Deeva on Flickr. Owh my gawd! This is a brilliant idea! And of course full of LOVE! Ok, fathers and mothers out there, start collecting your children's pix and archive them properly. Time flies and before you know it, 21 years had passed by you. I love this vid to the max. It shows love, dedication and perseverance. Season 1 has just begun in Asia and I cant wait for the next season. Yes I do love Fairy Tales no matter how grimm it turned out to be. I may get the DVDs instead. It sux when you cant really keep up with the show's schedule and you missed out on a few things while watching this at home such as my cats parading themselves in front of the TV screen or trying to show me the lizards they just caught. With DVD I can pause, rewind, fast forward and heck do anything I want! I saw this ad last night. Brad has definitely aged. I remember when I thought he was this beautiful man. He is still beautiful and as the screen turned black...I saw my own reflection, I thought,"Hey I have aged as well". I laughed and oh heck, maybe if I have a hubby I will buy him this perfume. I effingham (muh nu word) will. 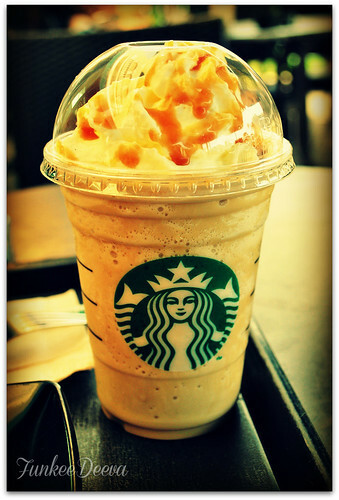 SALTED CARAMEL FRAP, a photo by Funkee Deeva on Flickr. Should I? Should I? Should I? 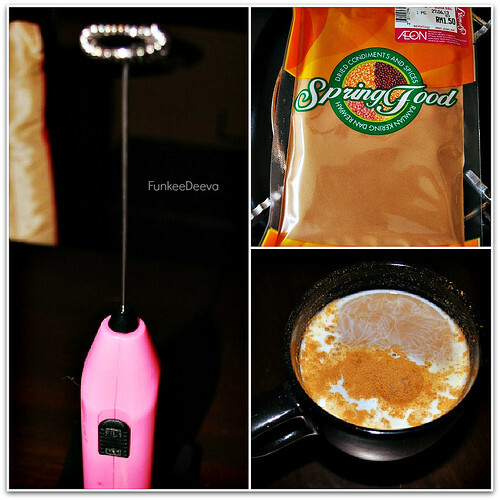 HOMEMADE CAPPUCCINO- ATTEMPT NO 1, a photo by Funkee Deeva on Flickr. MIRACLE WORKER, a photo by Funkee Deeva on Flickr. 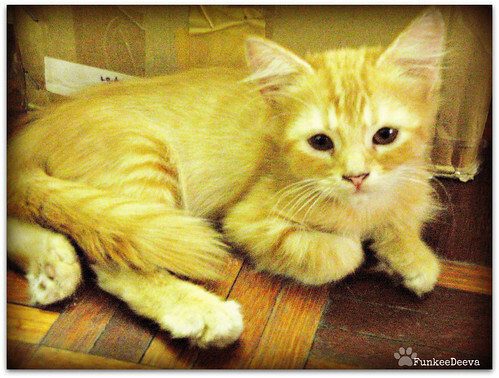 POOHTEH, a photo by Funkee Deeva on Flickr. 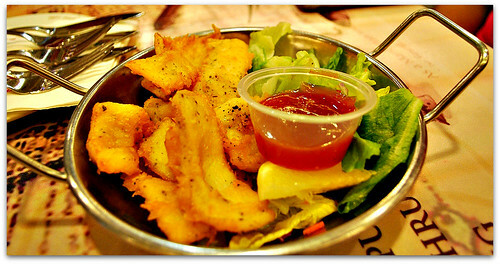 FLAMING PLATTER, a photo by Funkee Deeva on Flickr. Last Sunday I had this seafood cravings. I asked my sister and her friend to take me out. She took a while to get ready....my tummy was grumbling bad. Finally...they arrived to take me out. We were contemplating on where to go but finally decided on Sunway Pyramid which is not too far from my house. After battling with the crowd to find parking (sounds drama enough for you? 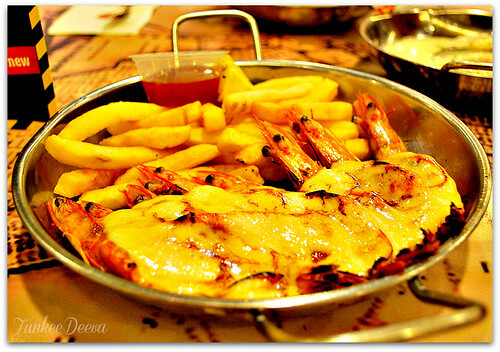 ), we went into the mall and ONE thing and ONE thing only for me which is EAT!!!! I saw Manhattan Fish Market. I went straight in (the rest of the clans had to follow me of course ). I ordered this and that. Though hungry, I felt that the quality of service there had declined. It dawned on me that no matter how hot your country is, enjoying "flaming" dishes should be done outdoors. If it's done indoors and inside a confined air-conditioned buildings, it spoiled the fun. O well, I was hungry anyway so, that thought was erased from my mind and continued eating. 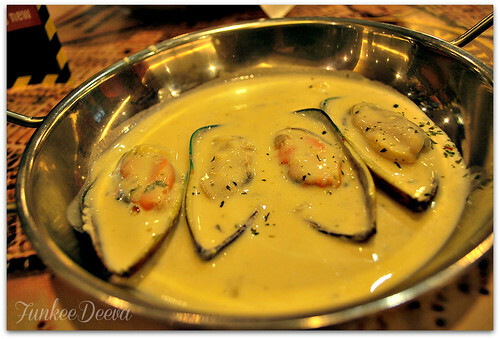 We had Flaming platter, Mussels in Garlic & Butter Sauce (dipping favs), Fried Calamari, Crab Marinara Pasta & Alio Olio Seafood. 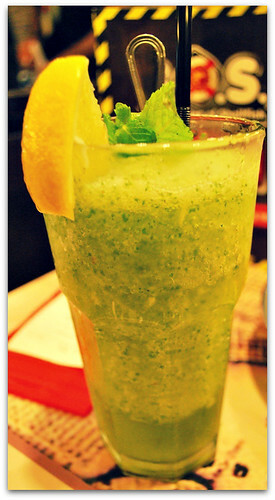 I had Mint leaves drinks in crushed ice and it was awesome. The evening arrived pretty fast. We had afternoon coffee at Starbucks. Salted Caramel Frappucino was awesome. I was a little disappointed with the red velvet. Probably because I had better. SITI, a photo by Funkee Deeva on Flickr.